Time to try adding an animated character to the Crank/Cam project! 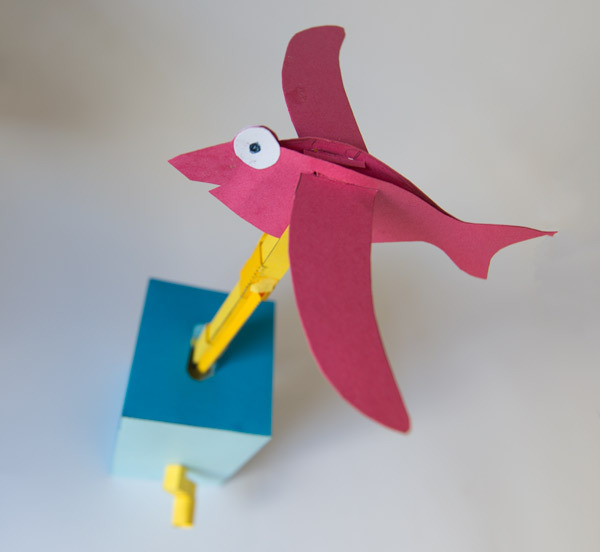 For this rough and ready prototype I put together a simple Flying Fish model. 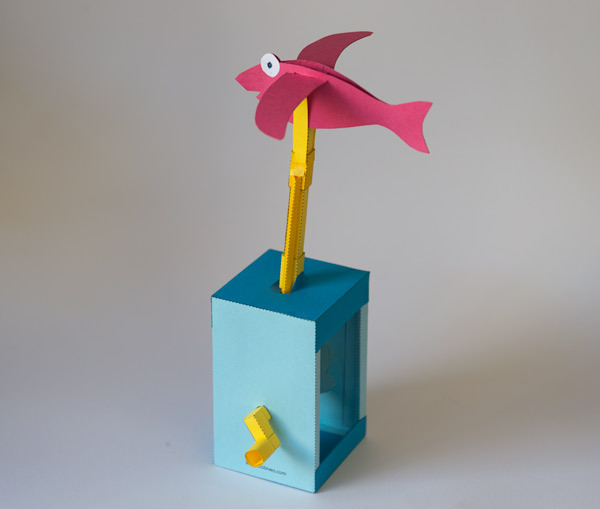 I cut out two identical fish shaped sides and glued them together at the nose and tail. I then glued the fish body to the top of the main push rod. 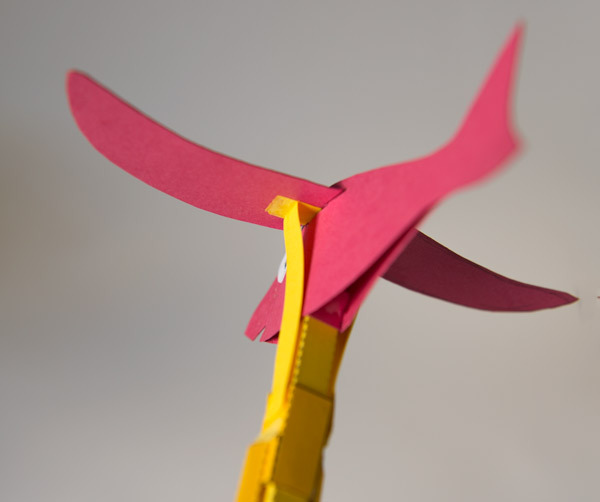 The fins/wings are made from double thickness card. 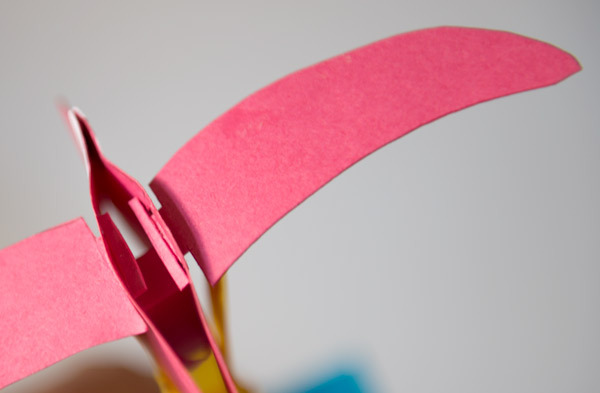 To make the joint as flexible as possible I slotted the wings through a hole in the body side then glued on strips to stop the wings falling out. You can see where I have tried different attachment points for the wing push rod. It worked best with the push rod close to the body. The other end of the wing push rods are connected to the crank driven slider tube making the wings flap quickly as the handle is turned. The result works a treat! I will probably make this into a downloadable project shortly. 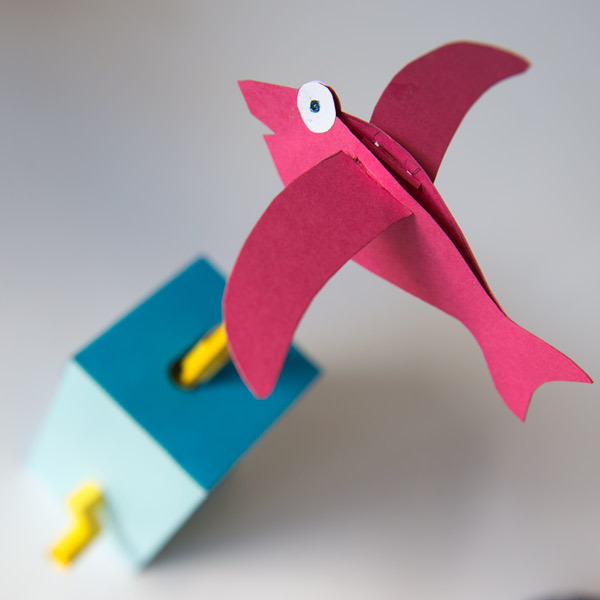 your prototype of the flying fish reminds me of the flying fish from your book “Paper Automata”. I built mine in 2006. Still working well! Ha! That’s amazing 🙂 Paper Automata came out in 1998 – nearly twenty years ago! I was thinking the same thing when I first saw the new eddition! It’s one of my favorite models, but then again I say that about all of them. BTW, what’s the history surrouning this particular model? How did you come up with the idea?